The think tank behind the pro-US free trade plan launched this week by leading Brexiteers went on a “lucrative” American tour to raise money for its Brexit work. 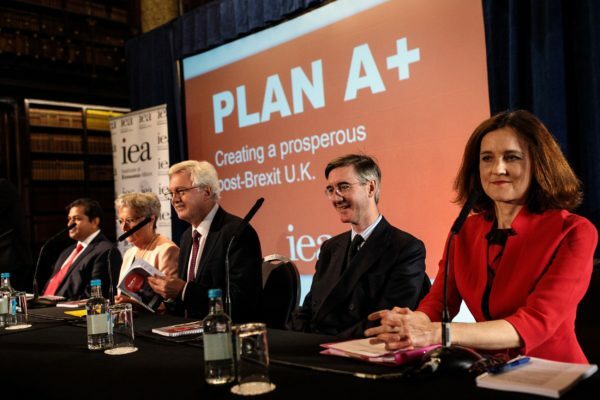 The Institute of Economic Affairs (IEA) and its trade policy chief, Shanker Singham, launched the “Plan A+” report in London on Monday with the backing of Boris Johnson and David Davis, as well as the European Research Group, an influential faction of Eurosceptic MPs led by Jacob Rees-Mogg. An Unearthed investigation this summer revealed that IEA boss Mark Littlewood had been on what he described as a “lucrative” US tour in February to raise funds for the IEA’s new trade policy unit. The investigation also showed the IEA offering to broker access to senior ministers for an undercover reporter posing as representative of US agribusiness investors. IEA director Mark Littlewood said the think tank, which is registered as an educational charity, was in the “Brexit influencing game”. The high-profile Plan A report has been widely touted as the arch-Brexiteers’ alternative to Theresa May’s Chequers plan. It calls for the UK to move away from the EU’s strict regulations to “capture the Brexit Prize” and strike free-trade deals with other countries, particularly the US. This could see the UK forced to loosen environmental standards and accept controversial products such as chlorine-washed chicken and hormone-treated beef. Sticking to EU rules for agri-food, as the Chequers plan demands, “means that the UK is severely constrained in its ability to change rules in the area of goods and agri-food, as well as in certain horizontal areas such as labour, and the environment,” the IEA report says. However in a meeting at the IEA’s offices in June, Littlewood told an undercover reporter that if they sponsored a report on “green Brexit” for £42,500, they would be able to influence the “content” and “salience” of issues that were relevant to their business. The trip, which he later described as “lucrative”, included stops at conservative think tanks with links to “dark money” donors such as the Koch brothers, the reclusive oil and gas billionaires who have pumped millions of dollars into climate scepticism and other libertarian causes. The IEA has an established US fundraising arm, American Friends of the IEA, which since 2010 has funnelled more than $500,000 donated in the US to support the UK think tank’s work, according to OpenDemocracy. During his US tour, Littlewood invited donations to the organisation. In a speech at an event in Florida, Littlewood called for the UK to join Nafta – the free trade deal between the US, Canada, and Mexico – saying the idea had support from senior Cabinet figures. At a Manhattan event hosted by the Atlas Network, which acts as an umbrella group for right-wing think tanks around the world, he described Brexit as an opportunity to “shred” EU regulations. At a meeting in Florida, he issued a “plea” for donations, adding: “I’m looking to establish in the next few weeks over in London a trade unit at the Institute for Economic Affairs that will have as its top priority pushing for US-UK free trade,” he said. The following month, Shanker Singham, who has been nicknamed “Brexiteers’ brain”, left the Legatum Institute and joined the IEA. Littlewood’s tour included a private fundraising breakfast with agriculture and energy tycoons in Tulsa, Oklahoma. The breakfast was organised by Michael Carnuccio, chair of the E Foundation, a pro-business Oklahoma think tank. “We got a bunch of money people around the table, Mark did the speech… and we talked about what was possible,” Carnuccio told Unearthed’s undercover reporter. He added: “Some of them were ag [agriculture] guys… and some of them were in oil and gas, and then two of them were just big donors to this cause, freedom, free markets, capitalists,” he said. Carnuccio said the E Foundation’s supporters had committed to donating $35,000 to the American Friends of the IEA. Elsewhere on the tour, Littlewood was hosted by the Illinois Policy Institute, a think tank that ProPublica reports has received funding from conservative donors including the Koch brothers and the Mercer family. Greenpeace USA recorded $113,000 in donations to the institute from the Charles Koch Foundation in 2015-16. The IEA boss was also hosted by the Mackinac Center, a Michigan-based think tank that has received millions of dollars from the Donors Capital Fund, which aims to provide anonymity for donors, as well as donations from libertarian foundations including those linked to the Koch, DeVos, Bradley and Scaife families, according to DeSmog. The IEA’s spokeswoman told Unearthed it does not usually comment on the funding of other think tanks.